Banggai Cardinalfish, Pterapogon kauderni. Image by Colin Foord, Coral Morphologic. For many years, it was an article of faith among conscientious aquarists and many marine biologists that the collection of reef fishes for the aquarium trade could never lead to the extinction of a species. The theory behind this is simple enough: most coral reef fish species are so widespread in the wild that human collectors, laboriously hand-netting their catches—mostly one by one—would never be able to threaten a species’ population over its full range. That was all before 1995, when Dr. Gerald Allen and Roger Steene ventured far into the Banggai Islands and brought back specimens and images of an exceptionally handsome black and silver fish that had the remarkable habit of mouthbrooding its young until they were fully able to fend for themselves. Aquarists found this trait fascinating, but biologists came to realize that this mode of reproduction could be a serious drawback: without a pelagic larval stage, when most marine fish are dispersed far and wide, the Banggai Cardinal was a homebody, found nowhere outside its own archipelago of 123 small islands in Indonesia. Unlike most Indo-Pacific species, whose distributions may stretch thousands of miles over many island groups, the Banggai could much more easily be overfished in its relatively limited native range. In this issue, our European colleague Daniel Knop delves into these controversies and the fears that over­collection for the aquarium trade may now be threatening this beguiling species’ future. Field research by Dr. Alejandro Vagelli suggests that the species is already seriously imperiled. Almost guppy-like in its ability to produce large, easy-to-feed fry, the Banggai Cardinalfish can best be saved by hobbyists breeding and choosing to buy only captive-bred fish, Daniel argues. Not quite so fast, says contributor Ret Talbot, who has a keen journalistic interest in sustainable collection practices. Wanting to know what informed sources in Indonesia have to say, Talbot sought out and interviewed Gayatri Reksodihardjo-Lilley, below, head of the Indonesian Nature Federation. Holding a master’s degree in conservation biology from the University of Kent in England, she has previously brought an Indonesian perspective to both the World Wildlife Fund Indonesia Programme and the Marine Aquarium Council’s activities in that country. She helped found LINI to offer a homegrown solution to Indonesia’s marine resource challenges. 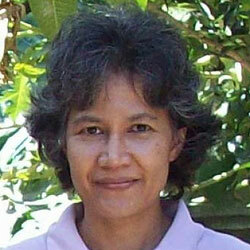 Gayatri Reksodihardjo-Lilley, image courtesy of the Indonesian Nature Federation, LINI. Lilley’s credentials, not only does she not share Vagelli’s grim view of the Banggai Cardinalfish situation, she urges us to continue supporting the wild harvest of this species and to help her country establish data on its status, teach local fisherfolk responsible harvest practices, and, in short, protect coral reef resources and the lives of the local people who depend on them. Perhaps it is the former Peace Corps volunteer in me, but I am cheered to learn that Indonesians are now taking the Banggai Cardinalfish situation seriously. We should applaud any such native stewardship efforts, as local solutions supported by local peoples passionate about their own resources have infinitely greater chances of long-term success than dictates parachuted in from the developed world. As Reksodihardjo-Lilley makes very clear, they know what to do, but they can’t do it without the involvement, understanding, and financial support of the global marine aquarium community. The Banggai Story is far from over, and how it ends will speak volumes about the future of reefkeeping, in our aquariums and in the wild. Credits: Banggai Cardinalfish, Pterapogon kauderni. Image by Colin Foord, Coral Morphologic.